The trade war and particularly the Chinese tariffs on imports of U.S. soya beans can now clearly be seen with the start of the soya bean peak exporting period in the U.S. In the first eight weeks of the 2018/19 marketing year accumulated U.S. exports are down 39%, from 12.2 million tonnes on 26 October 2017 to 7.5 million tonnes on 25 October 2018.“While weekly exports this season have been consistently lower than last season, the week to 18 October marked the single biggest decrease, from 2.5 million tonnes in the corresponding week last year, to just 1.1 million tonnes. Soya bean trade lanes may change due to the ongoing trade war. The shipping of soya beans from the US to China is one of the most significant ‘one commodity’ cargoes that may become affected by the trade war between the US and China. Soya bean trade lanes will be affected if the Chinese buyers shy away their traditional suppliers because of the extra cost from the proposed tariff on US soya beans. A move that may favour Brazilian ones further, which also hold a higher protein content. BIMCO’s Market Analysis Team launches a graph section, where BIMCO members can get an overview of a specific sector and how the supply side of that sector develops. “We have structured the data and made it easily available through our website. In this way our members will follow the most recent developments affecting their core interest. This gives them an unbiased and transparent tool for their decision-making process. 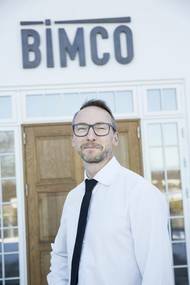 The goal is to ease the way to rational strategic business decisions,” says BIMCO’s Chief Shipping Analyst Peter Sand. The Baltic Exchange's main sea freight index, tracking rates for ships carrying dry bulk commodities, rose to its highest in three-and-a-half years on Friday, boosted by strong capesize rates. The overall index, which factors in rates for capesize, panamax, supramax and handysize shipping vessels, rose 32 points, or 2.18 percent, to end at 1,502 points, its highest since March 2014. The capesize index was up 199 points, or 6.75 percent, at 3,147 points, its highest level since November 2014. Tanker and dry bulk vessel newbuild contracts have been signed at an increasing pace so far in 2017, with newbuild activity for the first half of 2017 surpassing the same period last year by 20 percent. According to BIMCO, 5.9 million DWT was contracted in May 2017 and 3.1 million DWT so far in June 2017, which brings the total amount of newbuild orders up to 19.6 million DWT for 2017. So far for June 2017, 22 tankers have been contracted amounting to a total of 2.6 million DWT. For the crude oil tanker segment, this has been entirely for suezmax ships with 1.9 million DWT ordered. With an average age of 23.8 years, the fleet of very large ore carriers (VLOC) converted from very large crude carriers (VLCC) is vintage compared to the average age of 5.7 years for non-converted ore carriers above 200,000 DWT, according to BIMCO. But despite the huge 18.1 years age gap between converted VLOCs and normal VLOCs, the age itself is not the all-important explanatory factor behind a demolition decision. Naturally safety is a paramount issue, but also the fact that the vessels are still employed on a contract. The most recent available data show that demand for the container shipping grew by 2.7 percent in 2016. With the supply side growing by only 1.3 percent, this meant that the fundamental market balance improved for the first time since 2011. This development is primarily due to decisive actions by ship owners who sold excess tonnage for demolition. Hopefully, improved earnings will also follow soon. The metric-ton-mile demand side has grown by an average of 3.4 percent annually during 2012-2016. This is a new and lower growth level that has taken some time for the industry to get used to. As the dry bulk fleet grew by 2.6 percent year on year in January 2017 it exceeded 800 million DWT. This was due to dry bulk demolition being half of what is was in January 2016, while total dry bulk deliveries reached its highest level since January 2013. In February 2017, fleet growth reached 2.8 percent. If the fleet growth remains above 2 percent, the dry bulk shipping industry cannot rely on global demand to cure the oversupply caused by this fundamental imbalance in the market. Since Q1 2013, the significance of U.S. coal exports has seen a considerable setback, with 2016 achieving the same levels as 2009. This is due to the long-haul routes carrying coking coal from the U.S. East Coast and U.S. Gulf Coast to East Asia, are not operating to the same extent and the EU is demanding less thermal coal, says shipping organization Baltic and International Maritime Council (BIMCO). When BIMCO first published its story concerning U.S. coal in 2013, U.S. coal exports had the most significant coal trade in the world, measured by metric-ton-miles.